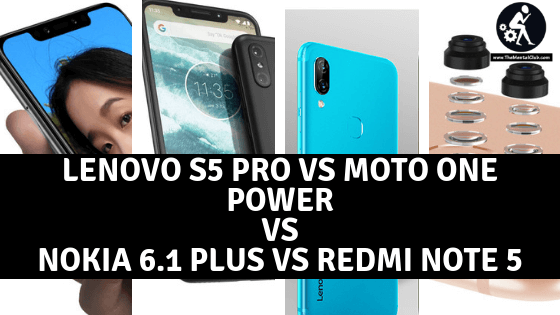 Compare Lenovo S5 Pro VS Moto One Power VS Nokia 6.1 Plus VS Redmi Note 5 Pro – Lenovo has officially launched Lenovo S5 Pro in China. The Lenovo S5 Pro is an upgrade version of the Lenovo S5 launched in March 2018. Now talk about some of the major features of the Lenovo S5 Pro. This handset comes with dual selfie camera, full-HD + display and Octa-core Qualcomm Snapdragon 636 processor. Price of this handset is 1,298 Chinese yuan (about 13,700 Indian rupees). At this price, Lenovo S5 Pro will be competing directly in the market with Motorola One Power, Nokia 6.1 Plus and Redmi Note 5 Pro. The price of the Lenovo S5 Pro 6 GB RAM – 64 GB Internal Storage is 1,298 Chinese yuan (about 13,700 Indian Rupees). There is also a 128GB storage variant of Lenovo’s handset whose price has not yet been announced. The sale of this phone in the domestic market started on October 23. The smartphone (Lenovo S5 Pro) is available in Black, Blue and Gold colors. At present, nothing has been said about the launch of this phone in India. One Month ego Motorola launched their best budget smartphone in India with 4 GB RAM and 64 GB of Internal storage. Price of Motorola One Power 15,999 in Indian Market. The Smartphone is exclusively sold on e-commerce website Flipkart. Nokia 6.1 Plus exclusively sold on e-commerce website Flipkart and Nokia’s own website. Price of this Smartphone 15,999 in Indian Market. 6.1 Plus has been available in Black, Midnight Blue, and White Colour. The price of Xiaomi Redmi Note 5 Pro starts at Rs. 14,999 in India. There will be 4 GB RAM and 64 GB storage variants at this price. For 16,999 rupees you will get a variant of 6 GB RAM and 64 GB storage. Sales of both variants of Radmi Note 5 Pro are sold on Flipkart, Me.com and Mi Home Store. Lenovo S5 Pro will run on ZUI 5.0 Operating System based on Android 8.1 Oreo. It has a 6.18 inch Full-HD + (1080×2246 pixels) display. its aspect ratio is 18.7: 9. This Smartphone includes Octa-Core Qualcomm Snapdragon 636 processor, Adreno 509 GPU and 6 GB RAM. Lenovo S5 Pro has a dual rear camera setup. The primary sensor is 20 megapixels, with F / 1.8 aperture and secondary sensor of 12 Megapixels with F / 2.6 aperture. There are two sensors on this phone for Selfie Lovers. The primary sensor is 20 megapixels with F / 2.2 aperture and the Secondary sensor is 8 megapixels. Rear camera setup takes portrait shots with artificial intelligence with 2x optical zoom. The front camera sensor comes with Infrared Face Unlock feature. AI Portrait, Beauty and Ambient Lightning Features are part of it. There are two variants are available 64 GB and 128 GB Both variants will support microSD card up to 128 GB. The smartphone has 4G VoLTE, Wi-Fi 802.11 AC, Bluetooth 5.0, GPS / A-GPS, USB-Type C, and 3.5mm headphone jack features. Ambient light sensors, electronic compass, fingerprint sensor, gravity, gyroscope and proximity sensor are part of the handset. Motorola One Power has a 6.2-inch Full-HD + (1080×2246 pixels) LCD Max Vision Panel, Its aspect ratio of 19: 9. The handset has the Adreno 509 GPU with the Octa-Core Qualcomm Snapdragon 636 processor. This phone has 4 GB RAM and 64 GB Inbuilt storage. Also, you use up to 256 GB MicroSD card on this device. Motorola One Power has dual rear camera setup. The primary sensor is of 16 megapixels and the secondary sensor is 5 megapixels. you also get a megapixels front camera to take the selfie and video calling. The battery is of 5000 mAh. Connectivity features include 4G VoLTE, Bluetooth 5.0, Wi-Fi 802.11 AC, USB Type-C and 3.5mm headphone jack. The fingerprint sensor is on the back of the phone. Nokia 6.1 Plus is an Android One variant of Nokia X6. this handset will run on Android 8.1 Orio Operating System. It has a 5.8-inch full-HD + (1080×2280 pixels) notch display protect with 2.5D Gorilla Glass 3. It comes with 19: 9 aspect ratios. It has 4 GB RAM with Octa-Core Qualcomm Snapdragon 636 processor. Nokia 6.1 Plus comes with dual rear camera setup. The primary sensor is 16 megapixels and the secondary sensor is 5 megapixels. The front panel has a 16-megapixel camera. The AI features have been provided for better photography. Inbuilt Storage is 64 GB and it is possible to use MicroSD card when you need it. The Nokia 6.1 Plus connectivity features include 4G VoLTE, Wi-Fi 802.11 AC, Bluetooth 5.0, GPS / A-GPS, 3.5mm headphone jack and USB Type-C port. There is a 3060 mAh battery in the handset. It will charge 50 percent of the phone’s battery in 30 minutes. This is possible due to the quick charge 3.0. The dimensions of the handset are 147.2×70.98×7.99 millimeters. Redmi Note 5 Pro runs on the MUI 9 based on Android Nougat. There is also a 5.99 inch full-HD + (1080×2160 pixels) display. The screen is of 18: 9 aspect ratio. Snapdragon 636 processor with 1.8 GHz, Adreno 509 GPU for graphics is integrated. 4 GB and 6 GB Ram variant is available in the market. The fingerprint sensor is also on the back part in this handset. Xiaomi Redmi Note 5 Pro has dual rear camera setup. On the back side is the primary camera of 12-megapixel f / 2.2 aperture. With it, there is a 5-megapixel sensor with F / 2.0 aperture. LED flash module with dual rear camera setup has been given. There is a 20-megapixel Soni Imax 376 sensor on the front panel. There is a storage 64 GB in both variants of Xiaomi Redmi Note 5 Pro and it is possible to use MicroSD card even when it is necessary. The connectivity features of Xiaomi Redmi Note 5 Pro include 4G VoLTE, Wi-Fi 802.11b / g / n, Bluetooth, 3.5mm headphone jacks and micro-USB. The battery is 4000 mAh. It claims video playback of up to 14 hours continuously. Its dimensions are 158.58×75.35×8.05 millimeters and weighing 181 grams. How will you understand real Samsung Phone?